Organize and beautify your garden with ease! 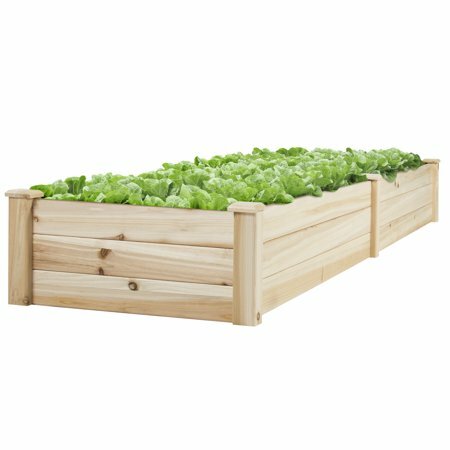 This garden bed is the perfect gardening accessory to grow luscious plants, delicious fruits and vegetables, and colorful flowers. An included divider separates and sorts different types of greenery for a diverse vegetation collection. The bed helps to maintain a healthy garden through elevation and keeps weeds from tainting soil, functions as a drainage system, and acts as a barrier to bugs and other pests. Show off your green thumb and turn any lawn or garden into a green oasis. I bought an above ground garden box because the soil in my yard is so bad. It came in right away. It was a snap to put together. Bought a square one at our local lumber company next, but the quality was not nearly as good, so I ordered another one just like the first one!! Perfect for what I needed, and for $50 this thing gets 5 stars. Some complain that the slats are difficult to slide into the posts but literally ten minutes of sanding their connection edges eliminates any problems. 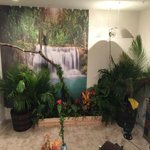 I used this to help turn my downstairs into a jungle, didn't have the background completely hung yet in the pictures, but you get the idea. We've been looking to get one of these elevated gardens for quite some time, but they were very expensive. When I saw the price for this one, I jumped on it. We now have tomatoe and cucumber plants growing like crazy!! Would recommend this to everyone! !